We were delighted that Ellie Peters won a CIFE College prize this year. 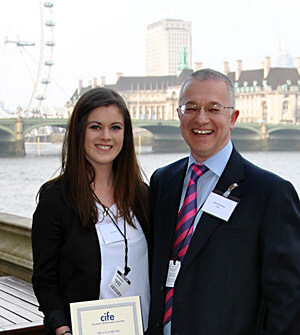 The picture shows her with Principal Stuart Nicholson on the terrace of the House of Lords where the annual CIFE awards ceremony took place. Ellie joined CCSS in 2013 and quickly demonstrated that she had a fine and enquiring mind in addition to a refreshingly enthusiastic approach to her work. She went on to achieve A*AA grades in Mathematics, Further Mathematics and Physics to secure her place at Durham. In her first year she gained a Tutor commendation, a Silver Award in the Maths Challenge and won a Paul Redhead Prize for academic achievement. She was also instrumental in organising visits to lectures at the Institute of Astronomy in Cambridge where she pursued her interest in astrophysics. At the end of her first year she was awarded a place on the Headstart summer programme studying Maths at Royal Holloway and also gained a place at The Physics Academy.